I'm so excited!!! My long-time friend and fellow pastor's wife, Leigh Powers, joined our pastor's wife blog in the summer of 2016 -- writing articles, assisting with social media, and also arranging for other guest bloggers to encourage pastors' wives around the globe. Now, Leigh is launching a devotional book for pastors' wives. Truthfully, I find many devotional books -- especially those aimed at women -- to be trite and shallow, or too syrupy for me to stand for very long. But this one stands apart. 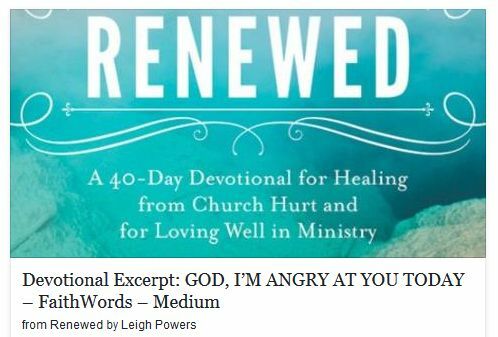 Leigh is a gifted and insightful writer, holding an M.Div.Bl from Southwestern Seminary; and more importantly, a love for her fellow pastor's wife. 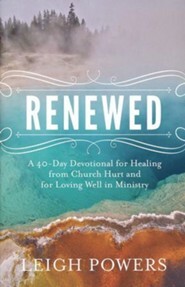 Each devotional practically identifies with the pain/emotions we're feeling, ends with encouragement and insight from God's word, followed by prayer and action steps that lead to healing. Read an excerpt online at Medium. This is the very first devotional in the book--the one that kicks off the 40-day journey from lamenting the pain to loving the church again. We live in a messy, sin-stained world. Those who are meant to be God’s people don’t always live like it. As ministers and church leaders, being on the front lines of the battle means we get hit by the shrapnel. It hurts, and sometimes anger is our gut-level response to the pain. Anger at ourselves. Anger at our churches. Anger at God, because it’s his fault we’re here in the first place.